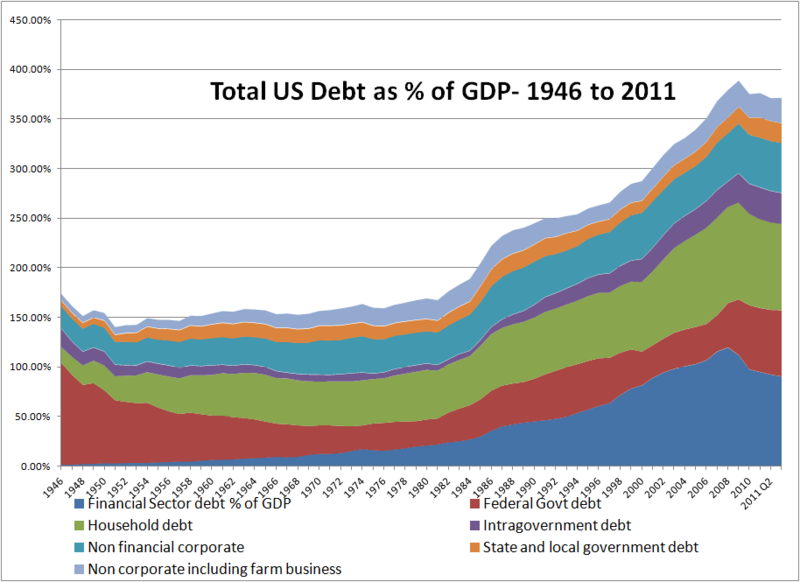 Total US debt as a % of GDP is some 371% of GDP as of the third quarter: this includes total financial sector debt and intra governmental debt. 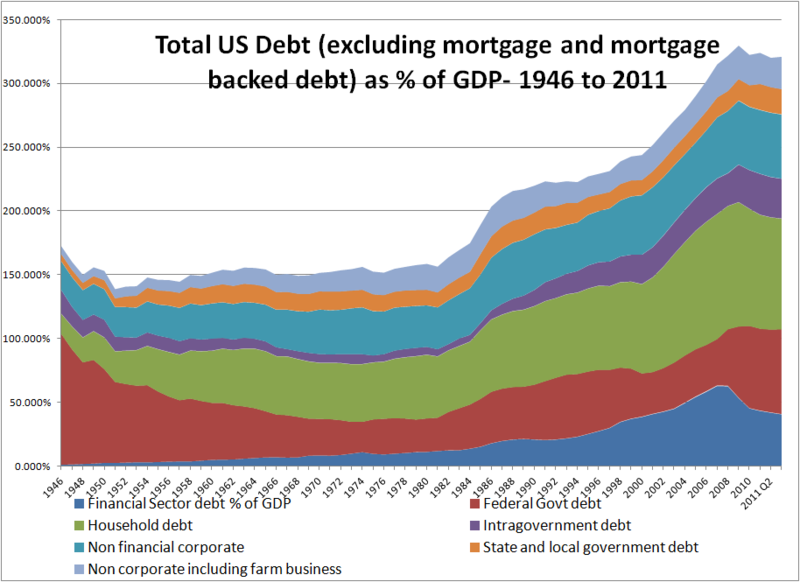 This total debt gives an idea of the integrated mechanics of debt within the US economy, with the financial system at its core. 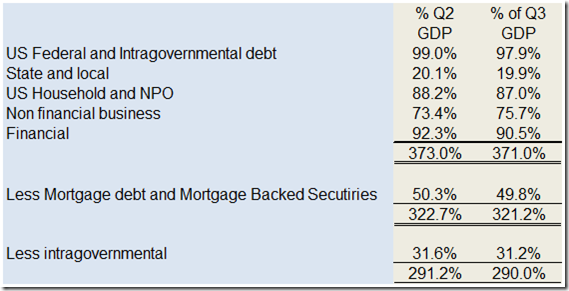 If we exclude financial sector debt, total debt comes to 280.5% of third quarter US GDP. 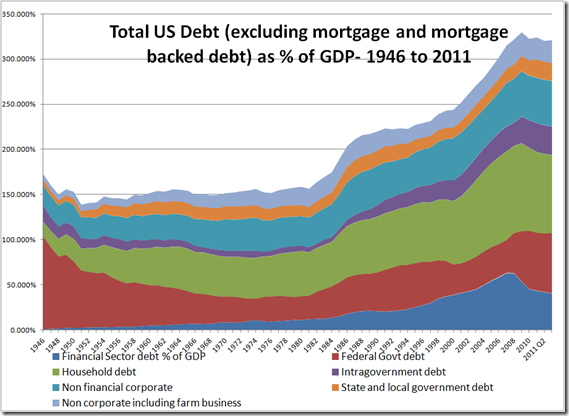 Adding back the financial system debt to get a picture of actual total debt is complex: all bank deposits and borrowings are liabilities used to fund their businesses. If we restrict financial sector debt to commercial paper and corporate bonds we exclude a large segment of the financial sector whose dynamics we are trying to capture. After all, what are we trying to assess when looking at debt? 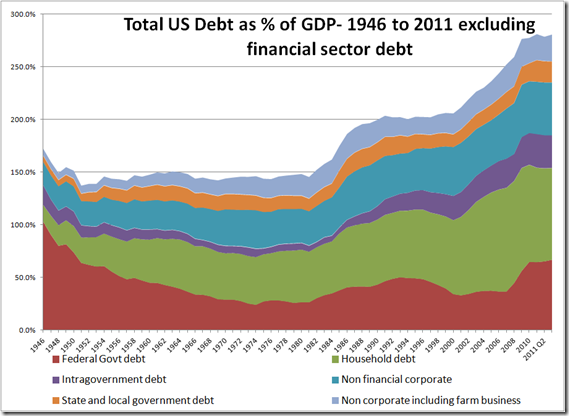 Total debt, and its risks and dynamics is the answer. What is more important than commercial paper and corporate bond issues is size and distribution of bank assets to GDP, which is especially relevant where we have inflated asset prices or default risk where balance sheet book values are not reflective of market prices. 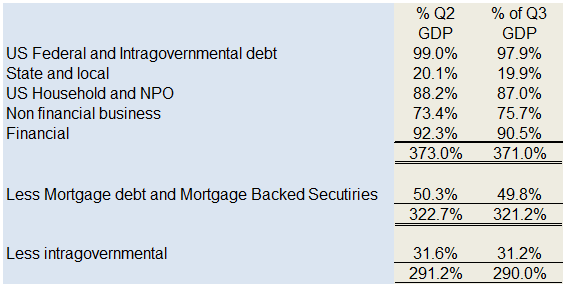 If we exclude mortgages and asset backed mortgage securities, the total debt ratio falls to from 370% to 321% of GDP (still including intra governmental debt). I include intra governmental debt because it is effectively a claim on future growth in final demand and if any or all of this liability needs to be written off, this will impact future growth in final demand. 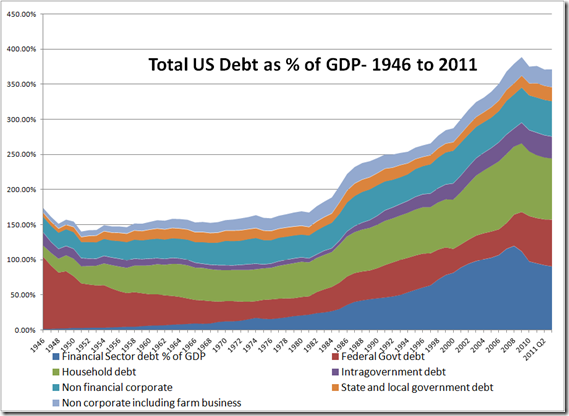 If you have to reduce Medicare or social security because of such debt, this will reduce GDP growth going forward. Ergo it needs to be included in the economy’s liability structure. Source statistics were taken from the Federal Reserve Z1 accounts and the Treasury Direct website. This entry was posted in Capitalism in Crisis, Economics, US Economic by Depthdynamics. Bookmark the permalink.